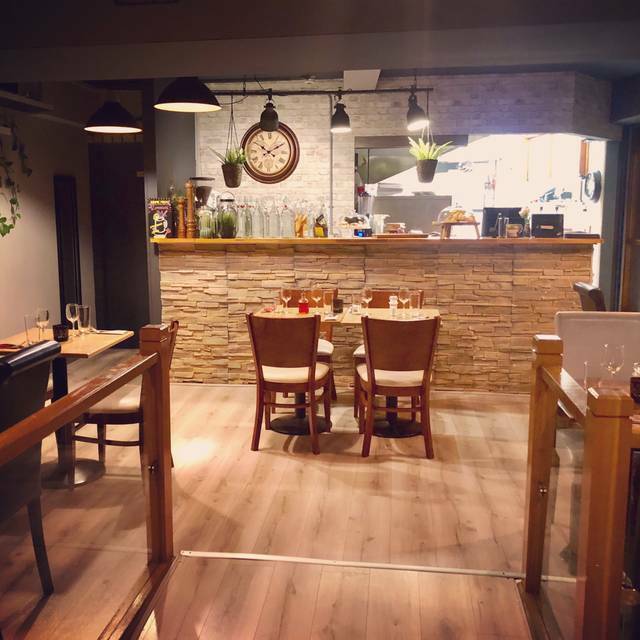 Jerusalem Restaurant is a unique fusion of the dishes we deem to be the best in the Mediterranean region. We’ve brought together a team of specialists from the Spanish cuisine, Italian cuisine, Greek cuisine and Lebanese cuisine to bring the first of it’s kind menu to our fair city of Dublin. Our hand picked cuisine is not only delicious, but also crafted with your health in mind. We only use the freshest ingredients and source everything locally. We specialise in Breakfast, Brunch, Lunch and Dinner. We also offer catering services for occasions. Excellent, friendly service. The live music was a nice touch and never felt intrusive. The food was delicious and dessert was great. My first visit recently was on a Friday evening and the restaurant was full and very noisy. This is my only reason for not awarding five stars. The food was excellent and my friend, who made different menu choices, fully agreed. The service was friendly and quick but not rushed so we could enjoy a leisurely meal. The only drawback was the noise level, which increased the longer we were there and made it difficult to hear ourselves talk. I'll look forward to going again on an evening that is less likely to have large post-work groups. 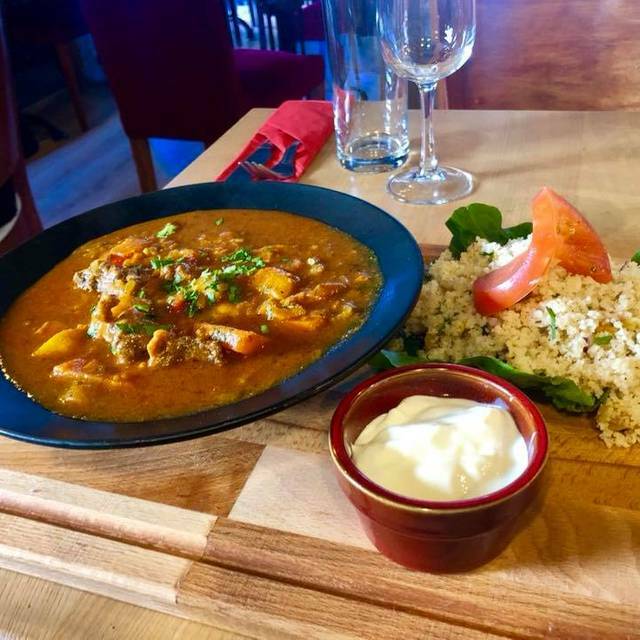 Delicious food, good value menus, and very nice waiting staff! There was also a great singer and keyboard artist. The food was ok, some dishes were amazing, some dishes like the Hummus or Babagagnoush not at all. The service was extremely unfriendly and non helpful. I wouldn't go there again, for what it was it is too expensive. The food was good but the service was terrible. We were there on Christmas evening for which we had reservations. They had a limited menu (pre-fixed) that evening, various appetizers, 5 choices for the main course and various desserts. The mains were chicken kebab, lamb kebab, lamb stew, falafel and a vegetarian stew. It took them an hour to serve us the mains after the appetizers came. We also noticed the two tables who came after us were served before we were. When brought to the servers attention, she said "what can I do?" I have never been so disappointed! To top it off, the price of the pre-fixed dinner is 50% more than the price of the food on any other day! I guess they figured, people didn't have other choices that night, might as well charge them more! Awesome Christmas dinner at the quaint restaurant in Dublin. We booked this reservation in order to avoid the exorbitant fees that Dublin hotels charge for Christmas dinner, and we were pleasantly rewarded with the meal and service! The appetizers platter and the lamb dish was excellent! Good times all around! We all enjoyed our food even though we were new to this type. Bread was excellent. Service was friendly and prompt. Portion size just right, not too big, I hate huge portions as they frighten my stomach and I can't eat much at all. Two of us shared Baba Ganoush as a starter, this got is in the mood and ready for a delicious main of Kofta and tomato sauce. We really enjoyed our meal. Really accommodating, friendly and attentive waiting staff. You could feel the desire to earn money in the atmosphere. The veggie options were really limited, the platter was mostly good falafel. The lamb dishes were most certainly mutton yet delicious. Te place was hopping, good energetic vibe, no frills, decent grub and byob helps the bill at the end. Incredible meal! 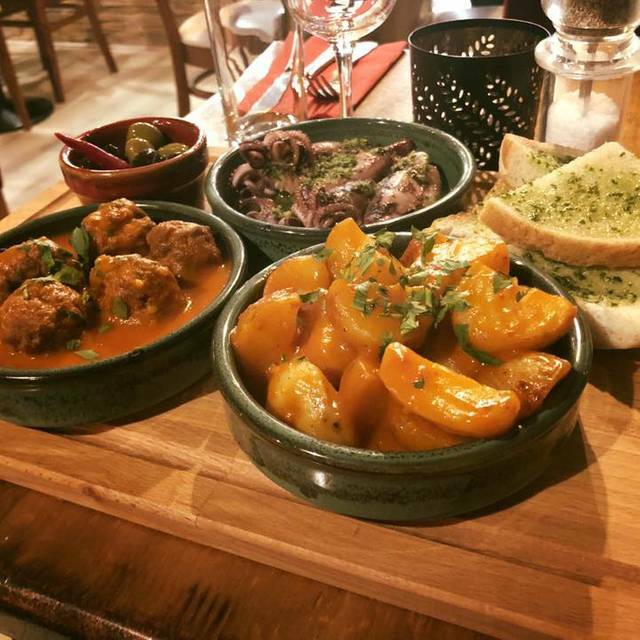 We had the shared tapas between ourselves which included patatas bravas, meatballs, piri piri prawns, hummus, garlic bread & baby squid. I just came back from Barcelona and the smoked chili compares to the best tapas I’ve had in barca (a place called Vinitus) really good value too as we could brought our own bottle of Rioja. Beautiful evening for less than €40. Will definitely be back! Why did they change the menu to add pizza pasta etc etc. Pick a limited menu and do it well. Loved it! Lovely fresh food, delicious flavours and a great buzz in the restaurant. BYOB makes it a very reasonable night! Will be back! 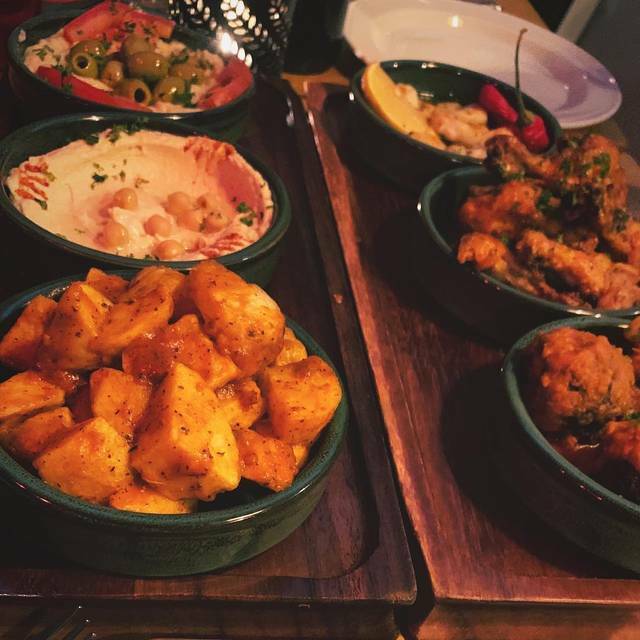 For a change we chose to share four dishes rather than sharing the mezze platter as we'd usually do. 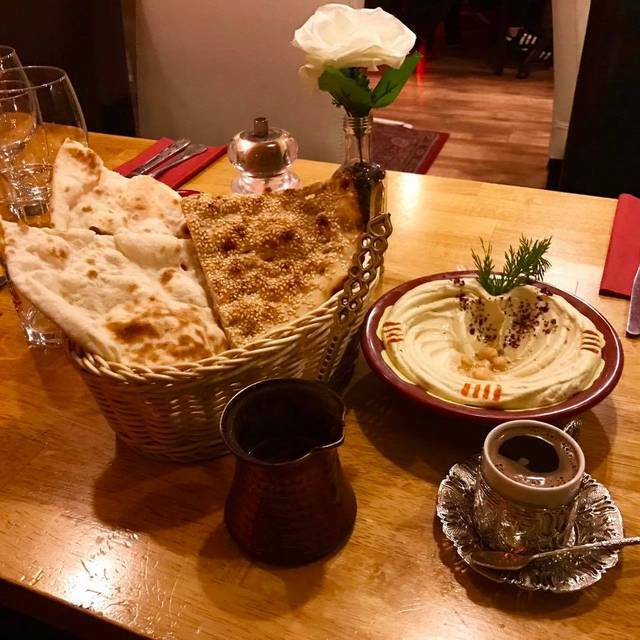 We had hummous, baba ganoush, a spicy potato dish which was absolutely gorgeous, and halloumi. You have to pay extra for the bread - and the bread is really lovely, freshly cooked and warm, kind of a flatbread but I don't know what it's called. But I don't like paying extra for bread - I mean, how can you possibly eat hummous or baba ganoush without bread or pita? I consider it part of the dish. But that's only a very small detail. The young woman serving was lovely - run off her feet but always took time to have a few words and to ask how we were. I went along with two friends, one being a vegetarian. We tried this place as it had been recommend by a friend and had lots of variety on the menu. We had falafel and halloumi to start with the fresh baked bread. Generous portions and I could not fault the food. Fresh ingredients and full of flavour. The staff here were lovely and couldn’t have been more helpful. The restaurant had a relaxed vibe and has nice music in the background to create this middle-eastern ambience. No alcohol is served here but there is a tesco nearby where you can pick up the bottle and you can enjoy it with your meal. Prices are also very reasonable and for the portion and food quality, it is excellent value for money. Very impressed and will definitely be back. My friend was really happy with the amount of choice she had for the vegetarian options too. We had a lovely meal, the waiter was exceptional helping us make choices and his recommendations were gorgeous. Friendly relaxed atmosphere. We will be back, the byob is a terrific option. Beautiful place, food, great value and lovely staff! Lovely meal at Jerusalem last Saturday night with my partner and some friends. The starters are fresh, tasty and the flat breads are probably the best I've had in Dublin. The main courses are a little unimaginative and are less adventurous but the portions are huge. I wasn't able to finish the salads. The next time I go I'll stick to ordering a variety of mezze with flatbreads. The BYOB means that this restaurant is very good value for money compared with the overpriced local competitors. Although they didn't have any record of my booking they were able to accommodate the party comfortably and we thoroughly enjoyed the evening. Thanks! Absolutely beautiful restaurant with fresh ingredients, a broad choice, lovely staff and a great atmosphere. I would highly recommend it! Delicious middle eastern cuisine. We ordered four or five starter plates and an falafel platter to get a broad sense of the dishes. Every morsel was eaten. We will have to return and work our way through the entire menu. Our waitress was very pleasant, helpful when asked, unobtrusive otherwise. The BYOB option really helps to keep the overall bill at a reasonable level. This was a lovely meal, with excellent friendly service from all the staff. Would recommend it. haven't been here in a while and I can't imagine why I haven't - the food is delicious and there's so much choice for vegetarians. The pitta bread is to die for - fresh off the oven, soft and gorgeous. We brought our own bottle of wine and that makes the bill pleasantly affordable. I am so glad I've remembered how great this place is. Very good ambiance, and food was amazing. 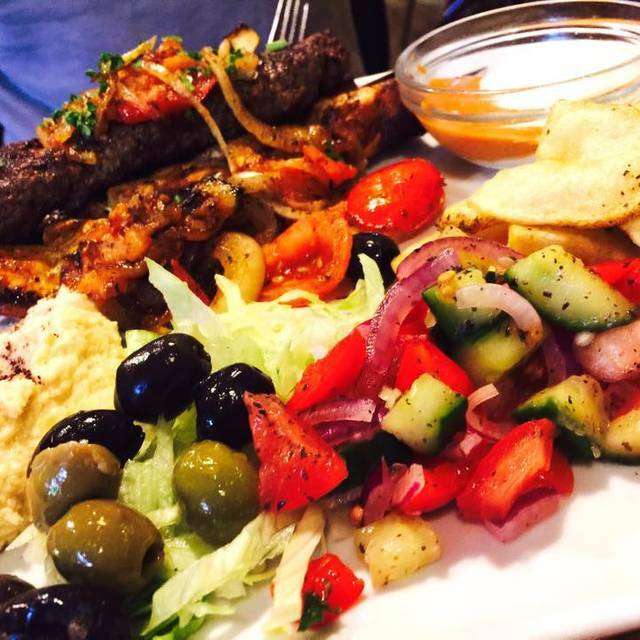 Excellent service and choice to those who want a taste of middle eastern food. Took my teenaged granddaughter and friend while on a visit to Tradfest. They are currently into veganism and adored the food. I recently visited with a party of 6. 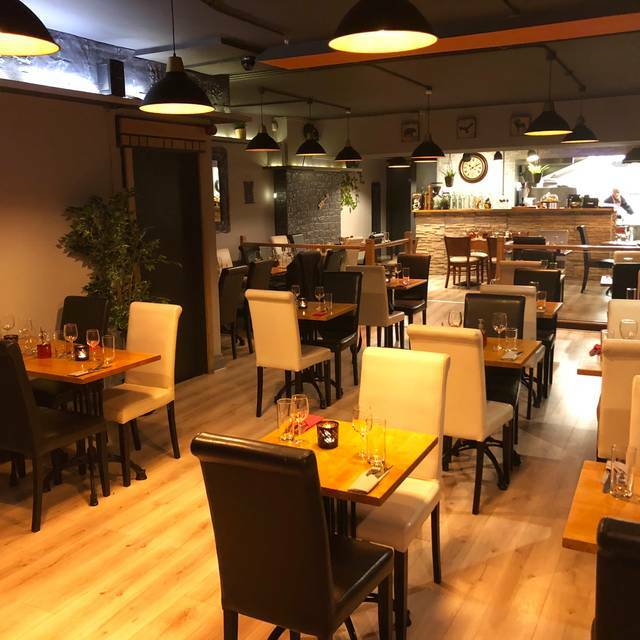 I have been there a couple of times before and the food has been lovely and staff friendly. However on this occasion, I was left waiting for my starter for 10 minutes so was eating it when everyone else was finished, my friend was left waiting for her main course for 15 minutes and again got it when everyone else was finished. We also ordered 2 extra sides and eventually got one after we asked 3 times. This is not acceptable and the restaurant should not take groups of people if they cannot deal with big orders. I, personally found it very embarrassing as it was a reunion and I was the one that had recommended it and booked it and the other guests were not impressed with the service at all. Starter was reheated cooked prawns with a poorly prepared salad. Main course of lamb was tasty but rice was dry and Luke warm. Deserts were okay. Very average food. Brought the family for my Brother's birthday. 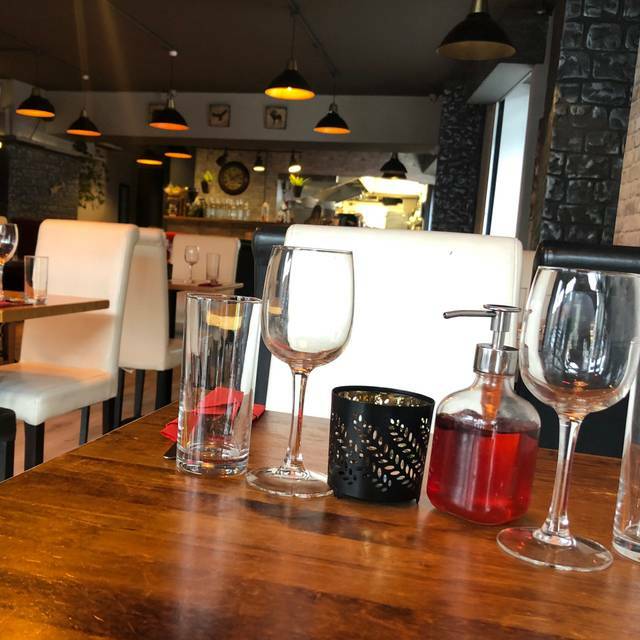 We had a fantastic evening, the food was just delicious and the staff are really friendly. The restaurant has a lovely bustling atmosphere as it is a really popular place. The BYOB is such a plus, and brings the cost of going out for a big meal right down. Will go again and again! 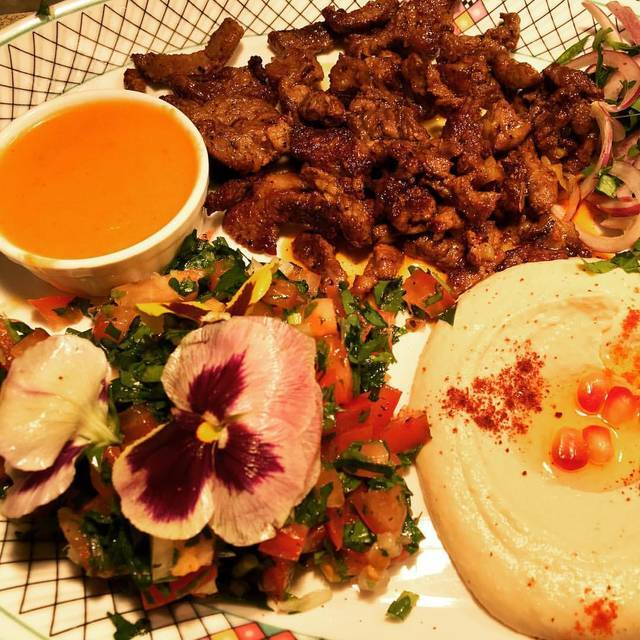 A nice alternative to mainline restaurants,with Middle Eastern dishes not widely available. Bring your own drink, no corkage (difficult these days with screw top wine bottles). Service pleasant and unobtrusive. We had four starters between two of us, rather than a a main course, before moving on to a concert at nearby Whelan's. Good value and an authentic atmosphere. Excellent service and food here- byob and there is a service charge to compensate for this but overall, good value- myself and my friend got three courses for €25 each roughly on a Thursday evening at 6.30Pm. I brought my own beers. Would highly recommend. Disappointed to be honest, the starters were very nice. I think they were around €8.50. The mains just didn't cut it. I ordered a chicken on the bone dish, which turned out to be a chicken leg/thigh piece with little or no meat and a bit of salad. €16 is pretty steep for what was received. If they took a look at their prices perhaps I'd consider visiting again. Overall, just not good value. An enjoyable tasty meal. Reasonable prices. Staff were very friendly.